The boss of RBS has admitted the bank "has to do better" amid a day of disruption for many customers following a computer failure. An estimated 750,000 RBS, NatWest and Ulster Bank customers were unable to use their credit and debit cards for three hours on Monday. Customers continued to report problems on Tuesday, with some saying funds had vanished from their accounts. 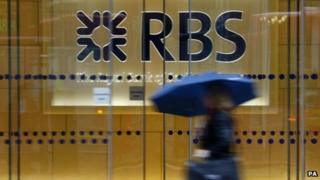 The RBS group said that it would compensate those left out of pocket. This included any fees incurred as a result of the computer failure. "Last night's systems failure was unacceptable. Yesterday was a busy shopping day and far too many of our customers were let down, unable to make purchases and withdraw cash," said RBS chief executive Ross McEwan, who took up the position at the bank in October. "I'm sorry for the inconvenience we caused our customers. We know we have to do better. I will be outlining plans in the New Year for making RBS the bank that our customers and the UK need it to be. This will include an outline of where we intend to invest for the future." RBS customers found they were unable to make online and card payments between 18:30 and 21:30 GMT on Monday. The day was expected to be one of the busiest shopping days of the year. It has been dubbed Cyber Monday because of the flurry of discounts offered by retailers hoping to boost their festive sales. Customers reported long queues at cash machines, with many not working at all, and shopping being abandoned in supermarkets as customers were unable to pay. Although cash machines are working, some customers were still reporting problems with accounts on Tuesday, with some saying that their balances were incorrect and that payments had disappeared. One of those was Wayne Brewster, who said he had to leave his shopping in Tesco on Monday and found the cash machine outside was not working. On Tuesday, the 42-year-old from Birmingham said he received an alert on his phone to say he was overdrawn. He realised that a £100 payment made on Saturday was missing, pushing him into the red. "I now have to go into the branch with proof that that credit should be there, which is an inconvenience," he said, revealing that he had also suffered from previous IT glitches at the bank. Other customers expressed concerns about the problems, which come at the start of the month when many direct debits are made for outgoings such as mortgages and rent. Susan Allen, RBS director of customer relations, told the BBC that the group still did not know the cause of the glitch, but was working through "a detailed analysis". "We've really caused problems. It is completely unacceptable that customers couldn't access their own money," she added. Regarding problems on Tuesday, the bank said: "We have heard from some customers who are experiencing issues this morning as systems get back to a fully normal service. "If any customer is still experiencing issues, they should get in touch with our call centres or come into our branches, where our staff will be ready to help. We will continue to monitor the service throughout the day." Ms Allen said these latest issues were "isolated", with some transactions taking longer to appear in accounts than might be expected. Chief Secretary to the Treasury Danny Alexander said RBS was "right to apologise" and offer compensation to its customers. "Ultimately, it is an operational matter for RBS to sort out as quickly as possible to make sure their customers are inconvenienced as little as possible," he said. In 2012, a major IT failure locked many RBS, NatWest and Ulster Bank customers out of their accounts for several days. The issue was particularly bad for Ulster Bank, with customers facing access problems for weeks. RBS, which is still 80%-owned by the UK government, said it had improved its services since the problems occurred in June and July of 2012, although it has had additional problems since. Media captionMartin Lewis, from Money Saving Expert website: "No compensation for distress or embarrassment"
The latest computer problems are an embarrassment for the new RBS boss, Mr McEwan, who gave a speech two weeks ago saying the bank would be fundamentally changing its customer service. He announced that a review of the entire RBS business was under way and that major changes would be made, including the introduction of new technology allowing customers to access their accounts online or via machines rather than using a branch. When Mr McEwan took the job, he wrote to tens of thousands of employees, saying: "We still receive far too many complaints, often on issues that would never arise if our systems and processes were more effective." Richard Lloyd, executive director of consumer group Which?, described the computer problems as a "shambles". "There is a problem across the banking industry as to whether IT systems are fit for purpose." Both RBS and NatWest have pages on their websites to keep customers updated about the service status of online banking, mobile banking, any planned maintenance work, and payment services.